So far this report has focused on the school construction boom and the ways it relates to the growth of the Hispanic population. The following section focuses on the schools most affected by growth in the number of Hispanic students. This analysis examines how many schools, and which ones, experienced the greatest impact and how the characteristics of those schools differ from the rest. As noted above, the Hispanic population remains substantially concentrated in a few traditional states even as it has begun to disperse to new settlement areas. And, within both traditional and new settlement states, the Latino population remains substantially concentrated geographically by neighborhood (Suro and Tafoya, 2004). Given that Hispanic enrollment is heavily concentrated in a relatively small set of schools, it is perhaps not surprising that the increases in Hispanic enrollment have also been relatively concentrated. As a result, the schools that were most affected by growth in Hispanic enrollment tended to be schools that already had large numbers of Latino students. The concentrated impact of Hispanic enrollment growth is most clearly illustrated by examining the 74,200 existing schools—those that were operating continuously since at least 1993-94. One-fifth of those schools absorbed twothirds (66%) of the Hispanic enrollment growth. Just one-tenth of the existing schools, 7,398 schools, handled half (52%) of the increase. In 1993-94, those 7,398 schools enrolled 2.1 million Hispanic students, or 40% of the total. By 2002-03, those same schools had more than 3.7 million Hispanic students, which was 44% of all the Latinos in U.S. public schools. In sum, as Hispanic enrollment grew quickly, most of the new students flowed into a relatively small number of schools that already were educating a sizable share of Latino students. However, as noted above, Hispanic population growth has been characterized by both concentration and dispersal. So even as half of the increase in Latino enrollment was concentrated in one-tenth of the existing schools, the other half was scattered across both existing and new schools. As a result, many schools that had very few Latino students at the beginning of the period under study experienced an influx. Because they started from a small base, even modest increases in the absolute number of Latino students produced very dramatic gains on a percentage basis. So, for example, at one-fifth of the nation’s existing schools the Hispanic enrollment at least tripled, but again in most cases those percentage gains involved relatively small numbers of new students. If schools across the country experienced the growth of the Hispanic student population in many different ways in terms of absolute numbers and percentage gains, how does one identify the schools most affected by that growth and measure the impact of the population change? There are, of course, many methodological possibilities. This analysis focuses on schools that experienced gains in Hispanic enrollment both in absolute numbers and on a percentage basis. To identify schools that can be identified as having been heavily impacted by Hispanic enrollment growth, the following analysis first eliminated the tens of thousands of schools that gained fewer than 100 Latinos. In addition, the analysis considered only schools whose Hispanic enrollment rose by at least 100%. By setting a threshold of schools that at least doubled their Hispanic enrollment, the analysis sets aside many large schools that already had substantial numbers of Latinos enrolled and where the addition of 100 or more would not have an inordinate impact. This double-edged criterion—an increase of at least 100 Hispanic students and at least a 100% increase in enrollment—produces a category of schools that will be referred to as “Hispanic-impacted” schools. Of the nation’s 74,200 existing schools, 3,369, or about 5%, fall into this category. 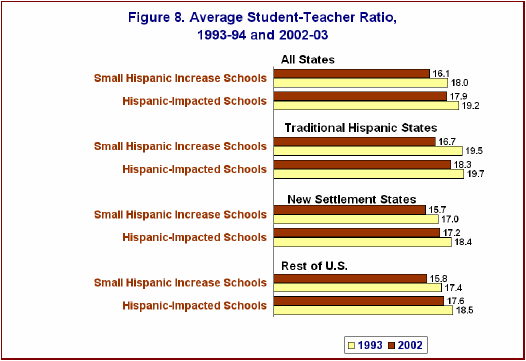 All other schools are referred to as “small Hispanic increase” schools. Because this analysis measures change in enrollment across a 10-year period, it necessarily excludes the 15,000 new schools in 2002-03 and deals only with the existing schools, which educate 87% of all students. In 2002-03, a total of 3.3 million students attended Hispanic-impacted schools and 37 million attended small Hispanic increase schools. So a relatively small share of students—8.2% of the enrollment in existing schools—attended schools most affected by the growth of Hispanic enrollment. It is important to emphasize that this criterion is not meant to identify the schools that were most heavily Hispanic but rather those that experienced the greatest impact from Hispanic growth. Nationwide, Latinos accounted for 34% of the students in Hispanic-impacted schools while they made up 18% of enrollment in all schools. Thus, while Hispanics did not make up a majority of the students in Hispanic-impacted schools on average, those schools were disproportionately Hispanic. Meanwhile, whites were somewhat underrepresented in Hispanic-impacted schools, making up 42% of enrollment in those schools compared with 59% of enrollment in all schools. Not surprisingly, the Hispanic-impacted schools are concentrated in traditional Hispanic states because that is where the bulk of the Hispanic population resides. Of the 3,369 Hispanic-impacted schools, nearly 1,900 are in the six traditional Hispanic states. They enrolled nearly 2 million students, or 12% of the total enrollment in existing schools in those states. In new settlement states, the 825 Hispanic-impacted schools enroll a similar share of total enrollment in existing schools (11%), but a much larger share of Latino students (38%). Nationwide, 6% of white students attended Hispanic-impacted schools. The share of white students at those schools was somewhat higher in traditional settlement states (11%) than in new settlement states (8%) (See Appendix Table C15). Public schools that experienced significant growth in the Latino population also experienced adverse changes. By 2002-03, Hispanic-impacted schools were generally larger, had more students on federal subsidies and had larger teacher-student ratios—the latter an important indicator that has improved across the nation but not as significantly in Hispanic-impacted schools. 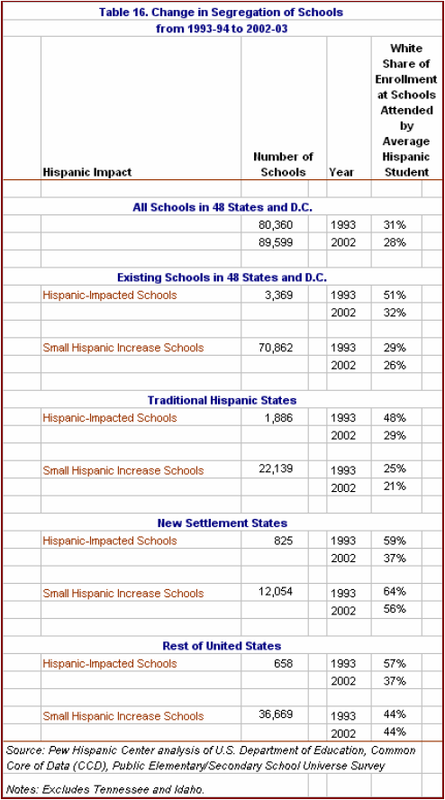 The most obvious difference between the schools most affected by Hispanic growth is that the Hispanic-impacted schools as a whole added significantly to their enrollment (674,000) while small Hispanic increase schools experienced declining enrollment (430,000) (see Appendix Table C14). While this increased enrollment was packed into the relatively small number of Hispanic-impacted schools (3,400), the decrease was spread out among the much larger number of small Hispanic increase schools (71,000). As a result, school size increased in the schools most affected by the Hispanic enrollment gains while remaining stable elsewhere. Nationwide, the average size of Hispanic-impacted schools increased from 787 students to 987, or 25%, while the size of small Hispanic increase schools changed only slightly, from 531 students to 524. The effects were most noticeable in states with the largest Hispanic populations. In traditional Hispanic states, the average size of Hispanic-impacted schools increased from 807 students in 1993- 94 to 1,053 students in 2002-03, a jump of 30%. Those with a smaller increase in Hispanic enrollment remained stable at about 638 students. 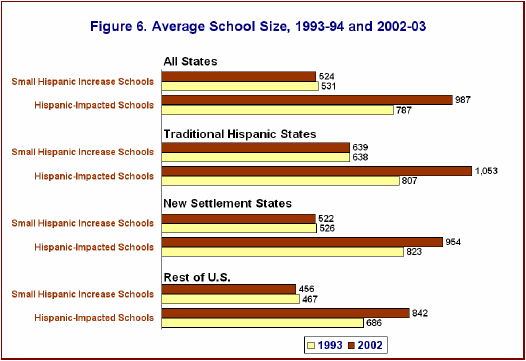 In new settlement states, Hispanic-impacted schools increased on average from 823 students to 954. Existing schools in new settlement states that had less Hispanic growth remained stable at about 525 students. A growing body of research literature indicates that larger school size, especially at the secondary level, is associated with less favorable student attainment (Fry, 2005). As noted above, the share of students in a school that is eligible for the federally funded free lunch program is an important measure of students’ economic status. The average proportion of a school’s students eligible for the free lunch program rose at existing schools from 1993-94 to 2002-03. The increase was markedly greater at Hispanic-impacted schools than at schools with a small increase in Hispanic enrollment (Figure 7). In traditional Hispanic states, the average proportion of students at Hispanic-impacted schools who were eligible for free lunches rose from 36% to 42%. The schools with a small increase in Hispanic enrollment on average experienced a small decline in free lunch eligibility. 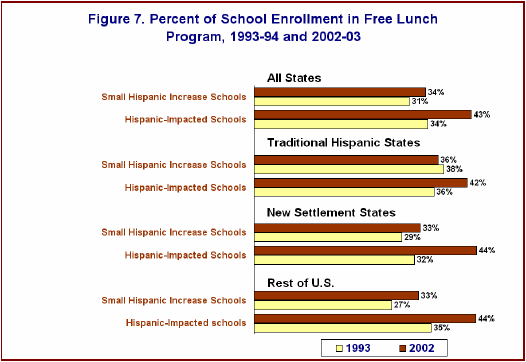 A substantially greater increase in free lunch eligibility at Hispanic-impacted schools in comparison to small Hispanic increase schools is also observed in new settlement states. The trend in public education since 1993-94 has been for the typical number of students per teacher to decline (Figure 8). Among existing schools, the student-teacher ratio has declined. The decline has been steeper at schools with a smaller increase in Hispanic enrollment than at Hispanic-impacted schools. Hispanic-impacted schools, aside from being larger and poorer, underwent a significant change in their ethnic and racial composition. Those schools became less white than schools that did not experience a surge in Latino enrollment. This analysis has shown that as the number of white students in the nation’s public schools declined, the number of schools that are predominantly white also declined somewhat. The decline, however, was not evenly distributed. Hispanic-impacted schools experienced not only substantial gains in enrollment because of an influx of Latinos, but also larger declines in the percentage of white students than schools less affected by Hispanic enrollment increases. Thus, in the most affected schools, as overall enrollment increased the share of Hispanics went up and the share of whites went down. Meanwhile, in the vast majority of schools, enrollment declined while there was a much lesser change in the mix of Hispanic and white students. Nationwide, the average share of white students in Hispanic-impacted schools decreased from 60% to 38%. Meanwhile, in all other schools the white share declined more modestly, from 71% to 66%. The trend was most evident in new settlement states, where white enrollment in Hispanic-impacted schools decreased from 65% to 41%. By comparison, the white share in schools that did not have a significant increase in Hispanic enrollment declined from 74% to 68%. The same pattern was evident in traditional Hispanic states. School segregation can be measured a variety of ways. This analysis uses a very widely known measure of segregation known as the exposure index. The exposure index tallied is the Hispanic-white exposure index, which measures the white share of enrollment at the school that the average Hispanic student attends. For the nation as a whole, school segregation for Hispanic children modestly increased over the 1990s, in the sense that the average Hispanic student’s exposure to white children declined (Logan, 2002; NCES, 1999). In this analysis, looking at all schools nationwide, the average Hispanic attended a school that was 31% white in 1993-94 and 28% white in 2002-03. 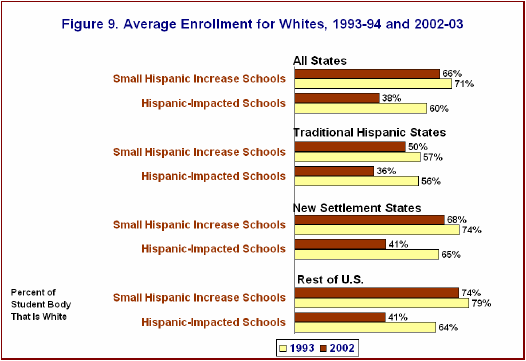 The decline in exposure to whites was much steeper in Hispanic-impacted schools (from 51% to 32%) than in the schools that had a small increase in Hispanic enrollment (29% to 26%).5 By this measure, segregation increased more in the Hispanic-impacted schools than in the schools that had a small increase in Hispanic enrollment. In the traditional Hispanic states, exposure to white students dropped steeply in Hispanic-impacted schools, as the share of whites in the school attended by the average Latino declined from 48% to 29%. Meanwhile, in schools with smaller increases in Hispanic enrollment, exposure to white students fell only from 25% to 21%. The new settlement states showed a similar pattern in which the share of whites in the school attended by a Latino student fell from 59% to 37% in Hispanic-impacted schools and from 64% to 56% in the small Hispanic increase schools.